The Fast Follower and First Mover Strategies overlap because, in order to pursue them, a law firm needs to have more institutional capability than with an Effective Purchasing Strategy. Without that capability, a law firm does not have the institutional muscle to compete, and is better off pursuing an Effective Purchasing Strategy. We believe an Effective Purchasing Strategy is the right tech strategy for law firms in most instances, with exceptions where the technology tends toward a natural monopoly and/or is not available for purchase. 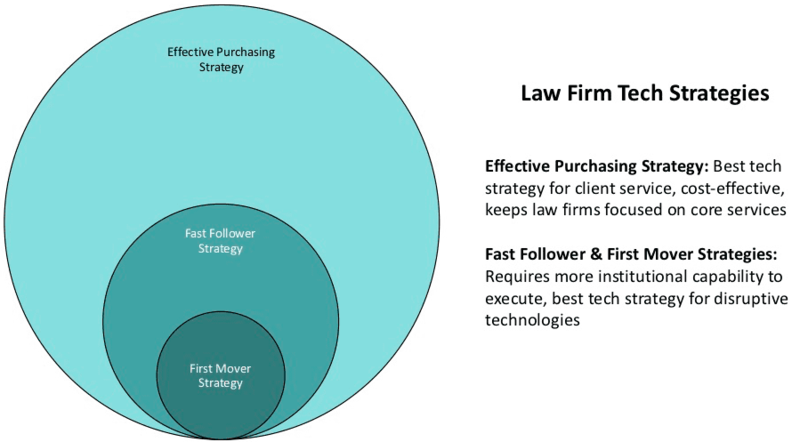 For those areas of disruptive technology, we believe law firms should pursue a Fast Follower or First Mover Strategy. We believe the two areas of technology that are genuinely disruptive to law firms are platforms and proprietary technology in AI/machine learning. The reason we wrote this article is because we have talked to many decision-makers at law firms that speak of following a Fast Follower Strategy, where on reflection we think they are speaking of an Effective Purchasing Strategy. We think we are in a good position to comment as we have spoken to many large law firms, and we hope this article helps law firms understand the opportunities and threats posed by Legal Tech. The Effective Purchasing Strategy prioritizes the traditional delivery of legal services to clients, and purchases products and services to pursue technology best practices as they develop. This strategy has worked for litigation with e-discovery technology, and works for a broad range of tech products that focus on the increased productivity of law firms, lawyers and their clients (“Productivity Tech”). 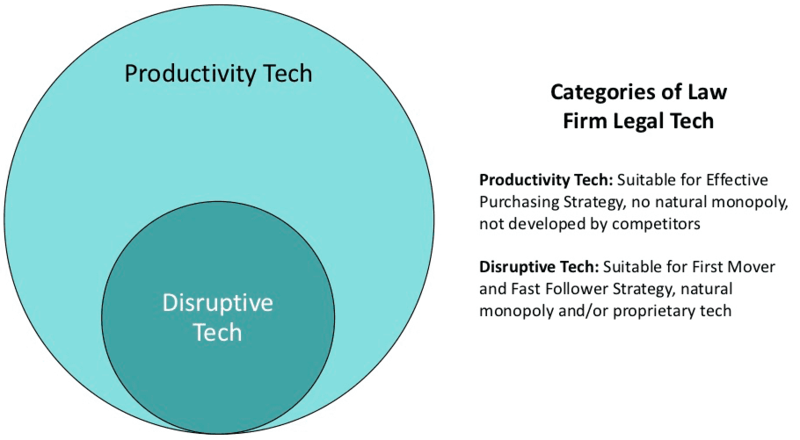 Productivity Tech constitutes the vast majority of Legal Tech offerings today, and the Effective Purchasing Strategy is a sensible, cost-effective strategy that does not create conflicts-of-interest with other law firms or clients. The Effective Purchasing Strategy is also fundamentally a good tech strategy for client service, which is and should remain a core aspect of any law firm’s tech strategy. We believe that an Effective Purchasing Strategy is the right strategy for most Legal Tech today. Platforms disintermediate clients from their law firms. So far, platforms have generally targeted the lower end of the market, but there are platform models for every market segment today. Usually platforms disrupt law firms by providing legal information at a lower cost, and examples of such platforms are Avvo, Thomson Reuters’ Practical Law and PartnerVine. Google is the most powerful platform for disaggregating information, and is arguably the largest factor in the rise of legal spending in-house and flat or negative revenues at middle market law firms. Top tier law firms are not as subject to disruption by platforms as long as they can provide star power for bigger deals and litigation, but, as keeping star power happy is a difficult strategy for the long-term, a tech strategy for platforms is nonetheless important. Among large law firms, law firms that have pursued a global footprint without developing star power are particularly susceptible to disruption by platforms. Proprietary technology is appearing notably in products that use AI/machine learning, and it is a fundamental threat to the Effective Purchasing Strategy of a law firm regardless of market segment. AI/machine learning is expected to automate large areas of legal services at the higher end, and the expected return is high enough that law firms are developing proprietary technology that may not be sold to competitors. If a law firm has a proprietary software for calculating the success of claims with a low margin of error, for instance, a law firm without that software will not be competitive, regardless of the reputation of the counsel. The Effective Purchasing Strategy assumes that tech can be purchased, and proprietary technology is a fundamental threat to that model. Both platforms and AI/machine learning create natural monopolies that are not effectively addressed by an Effective Purchasing Strategy. Platforms benefit from economies of scale in pricing, and AI/machine learning benefits from economies of scale in data. In so far as either is not available for purchase, they are fundamental threats to a law firm’s business. Streamlined decision-making for technology, and enough experience with that decision-making so that it is effective. Bandwidth at the managerial level to perform the triage necessary to decide which tech opportunities can be addressed with an Effective Purchasing Strategy and which ones are genuinely disruptive. Bandwidth at the operational level to execute, either independently or in partnership with third parties. Fast Follower Strategy. The difference between a Fast Follower Strategy and a First Mover Strategy is that Fast Followers follow where it can be more cost-effective. In practice, that can mean strategic discipline as much as a difference in capability or resources. The argument for fast followers compared to first movers is that they don’t have to spend as much to develop new products and services and may innovate more quickly in the long term by copying what they can. 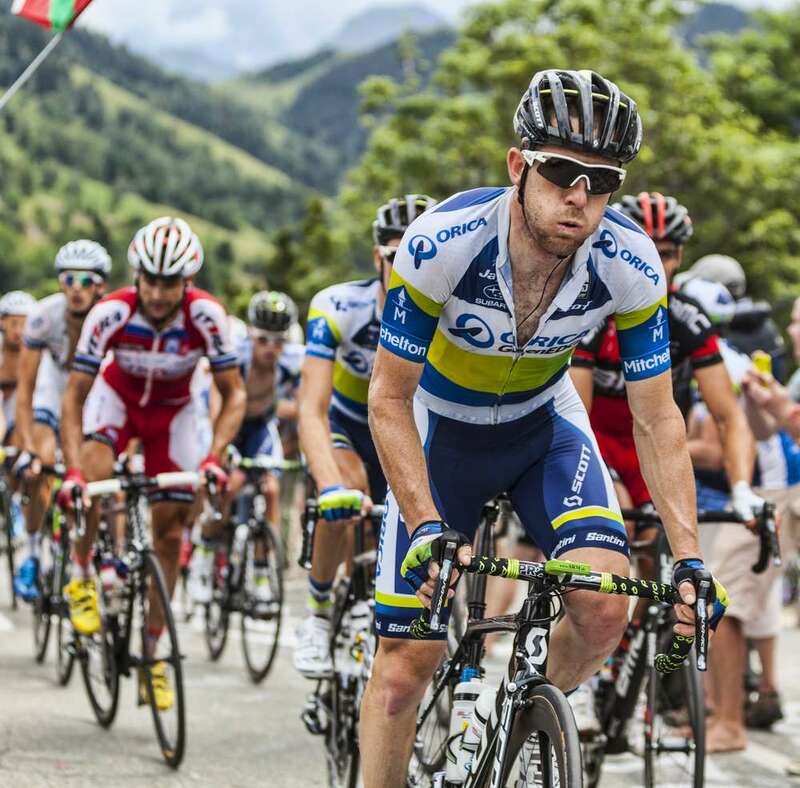 Fast followers do need top-level leadership though, as execution is key and the prospect of failure for a fast follower often looks the same as for a first mover. First Mover Strategy. Doing something the first time is always expensive, and a disciplined tech strategy will involve picking and choosing when to be a fast follower and when to be a first mover. When a firm has developed the institutional muscle to innovate, there will be compelling opportunities to be a first mover in a cost-effective manner, and a firm will benefit from both Fast Follower and First Mover Strategies. We believe an Effective Purchasing Strategy is the right strategy for Productivity Tech, which covers the vast majority of Legal Tech offerings today. A few tech opportunities are fundamentally disruptive to a law firm’s business, however, including platforms and proprietary technology in AI/machine learning. For Disruptive Tech, law firms should pursue a more proactive strategy, either as a fast follower or as a first mover.